Start off the weekend on Thursday the 4th at the top of the Swissôtel with direct eye view of the Chicago fireworks and enjoy Lebanese mezza. Party with David Hakim and his band who will be performing Friday and Saturday night until the morning hours. 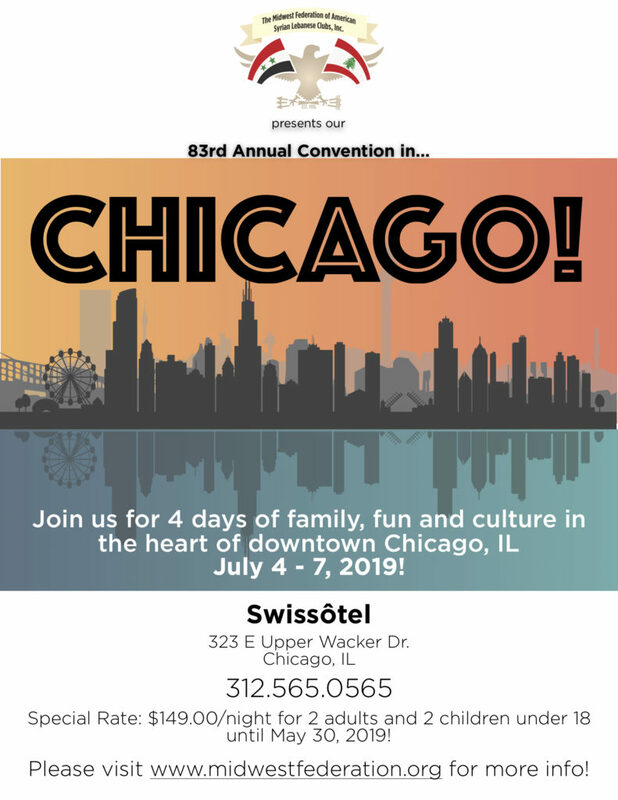 Convention book of tickets also includes transportation and entry to Shedd Aquarium, Chicago Architecture Cruise, lunch at Navy Pier’s famous Billy Goat Tavern and so much more. St Jude’s 5k walk/run and luncheon will be on Friday this year so plan to arrive Thursday for a fun filled weekend! Chicago offers many environmental treasures including 552 parks and 33 beaches. Two of the most popular parks in the city, Millennium Park and Grant Park, are just steps away from Swissôtel Chicago. While visiting Chicago, take a run or bike ride along the 23-mile lakefront path. Swissôtel Chicago directly overlooks many of the city’s most famous landmarks. 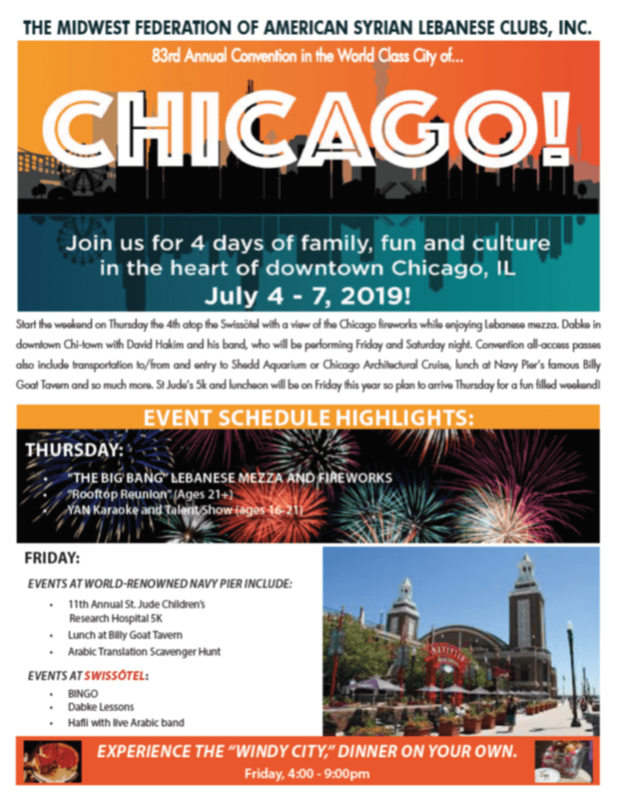 Nearby attractions include: The Magnificent Mile, Millennium Park, Grant Park, The Art Institute of Chicago, Chicago Shakespeare Theater, State Street Shopping, Willis Tower (aka Sears Tower), The Field Museum, Adler Planetarium & Astronomy Museum. It’s our 11th year supporting St. Jude’s, and this year there will be a special t-shirt design for those wishing to contribute and/or participate in the 5K! Shirts will be $25 each, and all proceeds will go directly to St. Jude’s. A link will be available soon so that you can do your part and help continue the amazing work of St. Jude’s. All donations of support are greatly appreciated! *Times and locations subject to change. 4:00pm – 9:00pm: Explore and Experience the Windy City! Farewell and safe travels home! 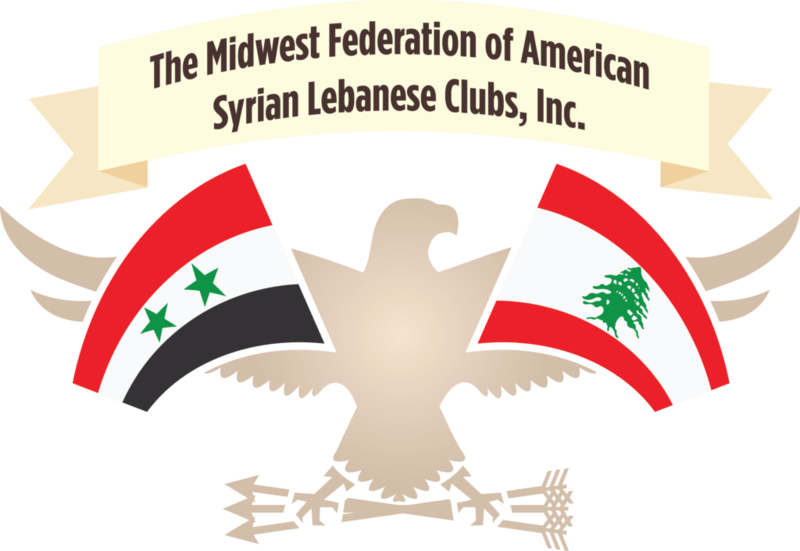 From July 4, 2019 through July 7, 2019, the Midwest Federation of American Syrian Lebanese Clubs, Inc. will be hosting its 83rd Annual Convention in Chicago, Illinois. It is expected to draw over 500 guests from the Midwest and surrounding areas. Becoming an event sponsor can make your your brand known to all attendees at the convention! Our 1tth annual 5k for St. Jude’s Children’s Research Hospital will take place on Friday, July 5, 2019. Check back for registration link!